The medals of Colonel George Lawrenson, C.B. (1803-56), comprising the Army of India Medal 1799-1826 with clasp Ava (engraved with his name as Lieut., (1st) Regt. of Arty. ), the breast badge of the Companion of the Order of the Bath (silver hallmarked for 1815), and the Sutlej Medal 1845-6 with clasp Sobraon (engraved with his name as Major, 2nd Brigade H. Ay.). My account a few postings back of the military career of Captain Thomas Edward Gordon, 14th Light Dragoons (my great-great-great grandfather), has led me to look at the careers of two of his wife’s uncles, one an officer in the East India Company Army and the other in the British cavalry. Together the careers of these three men cover most of the big wars of the earlier part of Victoria's reign– the first Anglo-Sikh War of 1845-6 and the second of 1848-9, the Crimean War of 1854-6 and the Indian Mutiny of 1857-9. They encompass some of the most glorified moments of war in the Victorian age, epitomised in Crimea by the 'Thin Red Line' of the 93rd Highlanders and the Charge of the Light Brigade at Balaclava, as well as an increasing realisation of the misery and squalor of war, brought home by vivid reportage and imagery, by the work of Florence Nightingale and by the horrors of civilian slaughter in India during the Mutiny. As well as their father, the Lawrenson brothers had an interesting military precedent in their great-uncle David Kerr, pictured here as a Major-General of Militia in Jamaica about 1805. He had gone from Scotland to Jamaica as a doctor, but was commissioned into the Militia aged 29 in 1768 and served in the war against the ‘Maroons’ – the descendants of runaway slaves – in the mid-1790s, by chance at the same time that the elder John Lawrenson was also there with the 18th Light Dragoons. The highlight of Kerr’s military career came in 1805 when the Governor mobilised the Militia against a possible invasion threat by the French, appointing Kerr a Major-General – the French Fleet was thought to be heading to Jamaica, but Nelson was in hot pursuit and in the end the clash took place not in the Caribbean but at Trafalgar (for an excellent account of David Kerr by one of his descendants, see here). These wars were, of course, far from the stereotyped image of Victorian colonial adventure, with death tolls amounting in the tens and even hundreds of thousands, and with far-reaching geopolitical consequences: the Sikh Wars resulted in the annexation of the Punjab and the final shape of British India, the Mutiny marked the end of East India Company rule and the beginning of the Raj, and the Crimean War –almost a world war – saw Russia held at bay and the Ottoman Empire, ‘the sick man of Europe’, propped up as a buffer zone, with profound implications for the future of the Middle East. These mid-century wars also saw the disjunction between increasingly effective weaponry – in particular, the replacement of the musket by the rifle as the standard infantry arm, first used by to devastating effect by the British in the Crimea – and tactics of close-order battle that were little changed since Waterloo, something that was to see even more horrific carnage in the American Civil War, in the Franco-Prussian War and on the fields of France and Flanders a few generations later. All of that would have been unimaginable when John and George Lawrenson took up their commissions in 1818-19, only a few years after Waterloo and with Europe at peace for the first time in generations. They had been born, on 2 February 1802 and 9 February 1803 respectively, in Restabrig, near Edinburgh, Scotland, to Margaret and John Lawrenson, who also had six daughters (Sarah, my four-times great grandmother, had been born in 1800). Margaret was the daughter and heir of George Simson of Invereighty, in Forfarshire, and the granddaughter of William Kerr, Provost of Forfar; her uncle David Kerr was a Major-General of militia in Jamaica (see opposite). A 19th century image of Invereighty House, the home of Colonel John Lawrenson and his family after his wife inherited it in 1794 on the death of her brother, William Simson (their father George Simson had previously owned it). Invereighty was one of three estates in the parish of Kinnettles, just south of the town of Forfar and about 13 miles north of Dundee. The house was demolished in the 1960s. The boys' father John Lawrenson, an Irishman, was a Captain in the 18th Light Dragoons at the time of their births, having been with the regiment when it served in Jamaica in 1795-7 and at the Battle of Bergen in Holland on 19 September 1799, one of the last set-piece battles to be fought by the British against Revolutionary France before the advent of Napoleon. Two accounts of this period of the regiment's history including mention of Lawrenson can be read online, Malet's Historical Records of the 18th Hussars (1869) and The Historical Memoirs of the XVIII Hussars (1907), the latter in more detail. The regiment had been raised in Ireland in 1759, eighteen years before Lawrenson first appears on the regimental list as a Cornet, and remained there until going to Jamaica; a fellow Lieutenant in 1792-3 was another Irishmen, Arthur Wellesley, the future Duke of Wellington. John Lawrenson’s name disappears from the list after 1803, when he was appointed Major of Brigade for North Britain (as Scotland was termed). Later he was promoted to Lieutenant-Colonel, but he saw no further regimental service and appears to have lived the remainder of his years on the estate his wife had inherited at Invereighty, passing it on after his death in 1836 aged 78 to his eldest son John (who then sold it out of the family). It would have been an obvious choice, then, for John’s two sons to opt for a military career, and not surprising that they might focus on India. A large proportion of the officers in the East India Company Army were Scottish, and in the Dundee area, near where the boys grew up, there were also many merchants and shippers involved in trade with India. Of the two boys, George may have been the more academically inclined, being educated at St Andrew’s University (the Matriculation Roll shows him there in 1815-16, aged only 14), and at Addiscombe, the military academy of the East India Company (Vibart's Addiscombe: its Heroes and Men of Note shows him there in 1818-19), and then being selected for an artillery commission, which along with the engineers required a generally greater academic aptitude than the infantry or cavalry. To trace the careers of Company officers we are fortunate to have Hodson’s Lives of the Officers of the Bengal Army, 1758-1834, collating details of service and family background not easily found elsewhere; the volumes are not yet online, but the entry for George is reproduced in the gallery at the bottom of this blog. This shows that after being commissioned into the Bengal Artillery in April 1819 he progressed at the usual slow rate through the ranks, reaching his final rank of Brevet Colonel in 1854. Promotion in the East India Company army was strictly by seniority, with men regardless of ability putting in many years as Lieutenants and Captains, and the only chance of accelerated promotion being the ‘brevet’ or extra-regimental promotions generally given at this period to Captains or Majors as a reward for distinguished service on campaign, or to Lieutenant-Colonels after a certain number of years within that rank to allow them a Colonel's pay and responsibility before they became too old. 'The Storming of one of the principal Stockades on its inside on the 8th of July 1824', by Lieutenant Joseph Moore (1825-6). Lieutenant Moore of the 89th Foot was present during the Burma campaign, and this aquatint is based on one of his sketches. Although this depiction is based on Moore's experience of the capture of Rangoon in July, it gives an impression of what George Lawrenson might have seen in October with Brigadier McCreagh's force, as described in the text. His artillery would have been used to breach the wooden walls of the stockades and allow the infantry to assault any Burmese defenders remaining inside, using their flintlock muskets and bayonets, as seen here (Lieutenant Joseph Moore, Rangoon Views and Combined Operations in the Birman Empire, handcoloured aquatints published by Kingsbury, Parbury & Allen and T. Clay, London, 1825). The first active service for George Lawrenson came in 1824 with the outbreak of the Anglo-Burmese War, an attempt by the British to stem the territorial ambitions of the King of Burma and to secure the eastern borders of India. 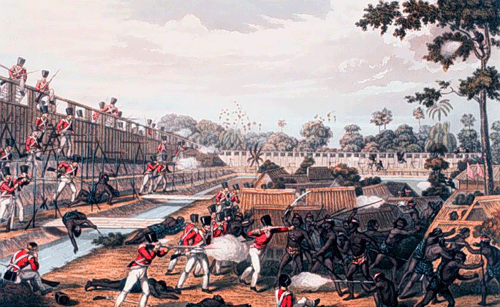 Though successful in its objectives, the war cost over 15,000 British and Indian dead, many from disease, and exposed the British to the first time to the problems of fighting in the Burmese jungle that were to be experienced again in the 1850s and 1880s and during the Second World War . The role of Lieutenant Lawrenson in this campaign is recorded in Chapter XIII of Stubbs’ History of the Organisation, Equipment and War Services of the Regiment of Bengal Artillery, Vol. 2 (1877) and in Buckle's less detailed Memoir of the Services of the Bengal Artillery (1852), both of which can be read online. Having gone out to Burma as Adjutant of the Bengal Artillery in the expedition, he joined a detached force in early October under Brigadier M. McCreagh of some 450 Europeans and 350 Indian infantry, himself commanding an artillery detail of one five and a half inch mortar, one five and a half inch howitzer and one six pounder field gun, on a mission to take several enemy stockades. McCreagh’s Despatch of 14 October, which can be read in the London Gazette, describes how the force passed bodies of fallen soldiers from a previous unsuccessful foray who had been fastened to tree-trunks on the roadside, ‘mangled and mutilated in every manner that savage cruelty could devise.’ He particularly singled out the artillery for praise: ‘The manner in which the Bengal Artillery was forced over the most unfavourable ground and various difficult obstacles, reflects high credit on Lieutenant Lawrenson and his detachment.’ For his part in the campaign, Lawrenson - who had to leave through illness before the expedition was over, like many others - was to receive the Army of India Medal with the clasp “Ava” (the name of the capital of upper Burma), though not until 1851 when a medal for campaigns in India from 1803-26 was finally authorised. ‘Charge of the 16th (Queen’s Own) Lancers at the Battle of Aliwal, January 1846’, showing an overrun Sikh field gun in the foreground. This gives a vivid image of the battle in which Major Lawrenson and his artillerymen distinguished themselves. Sir John Smith’s force was made up of a mix of British regiments, as shown here, and units of the East India Company army (British officered but with native sepoys), numbering altogether about 10,000 men with 24 guns (coloured aquatint by J. Harris after H. Martens, published by Rudolph Achermann, 1847. National Army Museum, Accession No. 1971-02-33-24). At Sobraon less than two weeks later Lawrenson was again singled out for praise by Smith for his command of a battery of six eighteen-pounders. For his participation in the war Lawrenson received the Sutlej Medal (the campaign medal for the first Anglo-Sikh War, named after the main river in the battle area), with his first battle, Aliwal, being engraved directly on the reverse of the medal, and the clasp Sobraon added for the second. As well as being mentioned in despatches he was made a Companion of the Order of the Bath (C.B. ), at that date the only decoration available to officers for gallantry or distinguished conduct in the field. You can see these actual medals and his Army of India medal at the top of this blog. Three years later he was promoted to Lieutenant-Colonel and five years after that to Brevet Colonel, his final rank. The Battle of Sobraon in 1846 was to be his last action, at a time when his older brother John was still almost eight years away from his first experience of battle. In this photo taken after his promotion to Major-General in 1860 he wears the ribbons of his two campaign medals (the Crimea Medal and the Turkish Crimea Medal) and two decorations (The Sardinian Medal for Valour and the Turkish Order of the Medjidie). George’s brother John had the distinction of commanding one of the regiments of the Light Brigade in the Crimea in the leadup to the Battle of Balaclava, but in missing the famous Charge by only two days as a result of illness. This accident of fate, which may well have saved his life, had no apparent effect on his career progression – he went on to hold the highest cavalry command in the Crimea, and later one of the highest at home as well – but it may well have dogged him in other ways, and may help to account for the fact that he never received the knighthood that might otherwise have come his way. Like his brother he had begun his career in India, but instead of entering the East India Company Army he went out with a King’s regiment, the 13th Light Dragoons, joining them in England as a Cornet aged 16 in November 1818 and departing for the five-month voyage to India on 9 February. His commission was purchased, at a time when there was no requirement for new officers in cavalry regiments to have undergone any form of military training or education. However, the biography reproduced at the bottom of this blog reveals a lifelong passion for horses, including riding to hounds when he was on leave and half-pay in England; given his father’s background he may well have been an experienced horseman already by the time he joined the army. ‘Battle of Alma, 1854’ by Orlando Norie, showing the Coldstream Guards. The Alma was best known for the achievements of the Highland Brigade, one of whose regiments, the 93rd, was to find further fame at Balaclava, after William Howard Russell – the celebrated war correspondent for The Times – described their defensive line as a ‘thin red streak’, later to enter popular parlance as the ‘Thin Red Line.’ This image could have come straight from the Napoleonic Wars, except that the British soldiers are firing percussion rifles – loaded from the muzzle in the same way as the smoothbore muskets of their Russian opponents, but far more accurate and with a greater range. The artist (one of the most prolific military painters of the 19th century) is thought to have based his Crimea watercolours on the sketches of his uncle Frederick Norie, who accompanied the Sardinian Army in 1854-5 (National Army Museum, Accession No. 1968-06-321-2). Barrett’s History of the XIII Hussars (1911), which can be read in full online, shows that the regiment reached Madras on 13 June 1819 and was soon in its station at Arcot, beginning a twenty year period in which they saw no active service, despite the 1824 war in Burma (see above) and the 1826 siege of Bhurtpore. In September 1822 Lawrenson exchanged into the 4th Dragoon Guards, then in Ireland (see Historical Record of the 4th Dragoon Guards (1839), also online), so left India after only three years. The annual Army List shows his subsequent promotions and his transfer to the 17th Lancers - also based in Ireland – in March 1827. Unlike his brother George, whose promotion was entirely based on seniority, John was able to advance through purchase and exchange, resulting in him being a Captain aged only 23 in August 1825, ten years before his brother reached that rank (though Lieutenants in the Bengal Army had more responsibility than those in the King’s Army, commanding companies, squadrons and batteries). After 18 years with the 17th he returned in 1845 as a Lieutenant-Colonel to his original regiment, the 13th Hussars – by then back in England – commanding it until going on half-pay in June 1848. Half-pay for an officer of his age and rank was often one step to retirement, and thus like many in the wake of the Napoleonic Wars whose regiments were based in Britain he would have completed a full career without once seeing active service. This, however, was not to be, as in June 1851 he came out of half-pay on being given command of his old regiment, the 17th Light Dragoons, soon to be known as the ‘Death or Glory Boys’, and three years later he embarked with them to the Black Sea to face the Russians in the Crimean peninsula. Because his regiment was part of the Light Brigade – Tennyson’s Six Hundred who rode into the Valley of Death, ‘Theirs not to reason why, Theirs but to do or die’- there are many first-hand accounts that mention Lawrenson, including the Journal of fellow regimental commander Lord Paget of the 4th Light Dragoons. They show that Lawrenson was present with the regiment on 20 September at the Battle of the Alma, the first major battle of the war and the first between European powers for almost forty years, since Waterloo. The cavalry were largely held in reserve that day, but the battle resulted in more than 9,000 casualties on both sides, a foretaste of the slaughter to come in the other great battles of the war - at Balaclava and at Inkerman that autumn and at Chernaya and the other clashes the following year during the Siege of Sevastopol. The whereabouts of General Lawrenson's medals are unknown, but this example of the British Crimea Medal bearing the same two clasps as his own shows why Lord Paget and other officers derided them as looking like decanter labels, by contrast with the more sober appearance of earlier campaign medals such as that of George Lawrenson for the Sikh War shown at the top of this blog. The Crimea Medal was authorised in 1855 while the war was still ongoing, so was distributed to soldiers still in the field as well as to the sick and wounded who had come home. He had recovered well enough by the following July to return as a Brigadier-General to command the Heavy Brigade, by then severely depleted by casualties and disease, and he still held this command when the Russians finally evacuated Sevastopol on 8 September and the fighting came to an end. He then succeeded Sir James Scarlett in December as overall commander of the cavalry in the Crimea, up to the time of the British withdrawal in early 1856. On 22 August 1855 Lawrenson had commanded the Heavy Brigade in the final – and bloodiest - set-piece battle of the war, the Battle of the Chernaya River, when a force of French, Sardinian and Ottoman infantry defeated the Russians, the British cavalry again being held in reserve. One of the Russian officers present was Count Leo Tolstoy, whose anger at the incompetence he saw, and the needless slaughter (a sentiment also expressed by the philosopher Frederick Engels in his report on the battle for the New York Daily Tribune), was to shape the image of war in his novels. The nearly 10,000 casualties at Chernaya added to more than half a million of both sides during the war, including nearly 5,000 British troops killed in action or died of wounds and more than 16,000 who died of disease during the campaign. In his Journal entry for 17 September 1855, Colonel Lord Paget - by then commander of the Light Brigade - reported the arrival for distribution of the Crimea Medal, a 'vulgar looking thing,' according to another officer quoted in Lord Angelsey's A History of British Cavalry, and disparaged by Paget for clasps that looked like decanter labels: 'I think the man whose taste the clasps were ought to be obliged to wear one. They already call them here "Port". "Sherry" and "Claret".' John Lawrenson had already received his medal with the clasp "Alma" from Queen Victoria at a special ceremony in London on 18 May while he was on sick leave, and was to add the clasp "Sebastopol" for his service after returning to take up command of the Heavy Brigade. The medal roll citations for the original award and the second clasp are reproduced in the gallery below. In addition, he received the Turkish Crimea Medal - given by the Ottoman Sultan to all British, French and Sardinian troops who took part - and the Turkish Order of the Medjidie (4th Class), and he was one of 400 British soldiers selected to receive the Sardinian War Medal for Military Valour awarded by the King of Piedmont-Sardinia in 1857. While George Fenton was taking photographs at the Front, John Lawrenson was one of four officers of the 17th Lancers present on 18 May 1855 at Horse Guards Parade in London to receive their Crimea Medal from the Queen, in a ceremony for wounded and sick soldiers who had been sent home. A list of all the officers receiving medals was widely published in the newspapers at the time. This is one of several contemporary depictions of the event to show the Queen with Colonel Troubridge, who was wheeled out in a bath chair - he had lost one leg and the other foot at the Battle of Inkerman. As discussed here, the Queen in her journal recorded her satisfaction in touching the hand of every soldier there, whether private or officer; it was said that some soldiers were reluctant to give up their medals for engraving, fearful that they would not get back the one touched by the hand of their Sovereign (Unknown artist, 'Distribution of War Medals by the Queen', coloured lithograph published by Read & Co., 8 June 1855. National Army Museum). The Sardinian Medal for Valour, from the collection of the National Maritime Museum. This example is fitted with a loop and ribbon as originally issued, but some recipients had theirs refitted privately with a suspension bar and ornate suspension arms more in keeping with the appearance of British medals (as was done with the Turkish Crimea Medal too). John's brother George Lawrenson had died in Cape Town on 26 June 1856 during one of three recorded leaves he took during his career in southern Africa, a common place of respite for officers in Indian service and a staging post before the opening of the Suez Canal on the long voyage to and from Britain. He had married twice, first aged 19 in 1822 in Mauritius to Mary Anne Mather, who died in Calcutta less than three years later aged only 22 (they had a daughter, who appears to have died young), and second to Charlotte Brown, daughter of an officer of the 41st Regiment, who died in Cheltenham in 1868. John, meanwhile, remained in the Army after the Crimea, serving as Inspector-General of Cavalry from 1860-65, and in the largely honorary positions of Colonel of the 8th Hussars from 1865 and of the 13th Hussars from 1868. He was promoted to Major-General in 1860, Lieutenant-General in 1868 and full General in 1875, two years before his retirement in 1877, aged 75, and he died in London on 30 October 1883, aged 83. He had not married. John Lawrenson was to receive no British decoration in his later career despite his high command - something not unprecedented among men even of high rank who were disinclined to push themselves or to cultivate political patrons, or had some perceived black mark against them (conceivably, had Lawrenson ridden in the charge at Balaclava, and survived, things might have been different), but which in his case was seen as sufficiently unjust to provoke the protestation you can read in the 'letter to the editor' reproduced in the gallery below alongside an obituary that appeared widely in the newspapers. Lawrenson is also variously spelled Laurenson, Simson is spelled Simpson and Invereighty is Inverighty. Images of the original birth records for the Lawrenson brothers and their siblings, their parents' marriage and death records and records related to their Simson and Kerr forbears in Forfarshire can be found on the official Scottish records website, scotlandspeople.gov.uk. It seems probable that the elder John Lawrenson was from the Lawrensons of Capponellan, Durrow, Queen's County (modern Co. Laois), the only family of that name in Ireland in the mid-late 18th century to appear in the records. I'm grateful to Captain Mick Holtby of the Queen's Royal Lancers and Nottinghamshire Yeomanry Museum for providing me with a copy of the photo of General Lawrence with the identifying label. Another photo of him, though possibly the same one, is in an album in the collections of the National Army Museum (Accession No. 1982-04-413), which also holds nine pieces of correspondence from Brigadier-General John Lawrenson to Sir William Codrington (commanding British forces in the Crimea) from December 1855-April 1856, as part of the Codrington Papers. Click on the following to enlarge. From left, the first part of the Crimea Medal Roll for the 17th Lancers (UK National Archives, WO 100/24) listing John Lawrenson and his entitlement to the clasp 'Alma'; second, the Roll showing his additional entitlement to the clasp 'Sevastopol'; third, part of an article in the London Evening Standard of 19 May 1855, reporting on the Crimea Medal presentation by the Queen at Horse Guards Parade listing all of the officer recipients, with Lawrenson under 17th Lancers; and fourth, an extract from the List of Officers, Non-Commissioned Officers and men selected to receive the 400 War Medals for Military Valour presented by His Majesty the King of Sardinia to the British Army engaged in the late War in the East (Her Majesty's Stationery Office, 1857), showing the three recipients selected from the 17th Lancers, including Lawrenson (for the full list, go here). The National Army Museum holds a printed list from July 1857 of all British officers recommended for the Order of Medjidie. Below left, an obituary of General Lawrenson syndicated from The Times (this one the York Herald, 3 November 1883); centre, a letter to the editor of the London Morning Post lamenting the failure to award Lawrenson a knighthood; right, a biography of John's brother Colonel George Lawrenson from Hodson, V.C.P., List of the Officers of the Bengal Army, 1758-1834 (London, 1927-46).